Denise Ward Designs‘ Bi-Monthly Jewelry Giveaway celebrates Winter! Whether we love it or not, the Winter Season is just around the corner:) These adorable Swarovski Crystal Sterling Snowmen Earrings are sure to keep your spirits high! Remember, if you have already registered for a past Giveaway and haven’t won, you are already in the running to win! 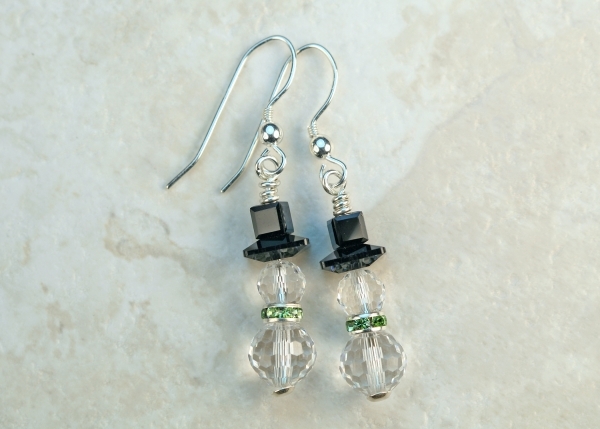 Handmade Swarovski Crystal Sterling Earrings – made with Swarovski Crystals and solid sterling silver. You choose whether your snowmen wear a red or green Swarovski Crystal scarf! Earring length is approximately 1″. This entry was posted in Beaded, Giveaway, Handmade, Jewelry Designs, Silver, Unique and tagged Christmas Jewelry, contest, free jewelry, giveaway, handmade jewelry, jewelry, jewelry designs, snowman earrings, snowman jewelry, snowmen earrings, snowmen jewelry, Sterling silver, Swarovski, wearable art by Denise Ward. Bookmark the permalink.